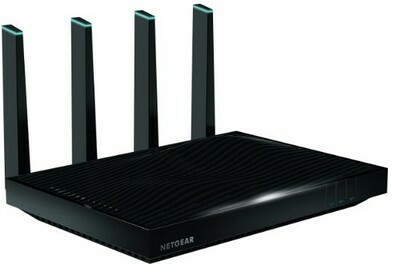 Over the last couple of years, Netgear have been releasing a new breed of router, known as the Nighthawk. 2015 is no different. So far we’ve had the R7900, the C7000, the R6700, and now we have the latest and the greatest – the Netgear Nighthawk X8 R8500 AC5300 router. It’s their second Tri Band (the first being the X6 R8000, which was released last year), and has been beefed up to tempt the heavy users among you. Not only is it Tri Band, but it’s MU-MIMO ready – Netgear’s first venture into this territory. It’s not been confirmed as to when the MU-MIMO feature will become available, but Netgear claim it should be available by the end of 2015 with a firmware update. The X8 supports up to 5.3Gbps Wifi. It’s the first manufacturer to do so. Excellent if you use a NAS drive for streaming videos. This is helped along with 1024 QAM radios that pump out over 2Gbps over each 5GHz radio. Just like the Nighthawk X6 before it, the X8 is a Tri Band router. This means your 5GHz clients are load balanced with Smart Connect over two bands to make your network as efficient as possible. 2x 2.16Gbps 5GHz radios & 1x 1Gbps on 2.4GHz radio total up to a huge 5.3Gbps theoretical throughput. Be afraid, be very afraid! Netgear have finally stepped into the land of MU-MIMO technology. This 4×4 Quad Stream router can provide MIMO wifi across multiple clients resulting in more efficient access all round. And here’s another first. The X8 R8500 has active antennas which re-engineer how amplifiers interact with the antennas. Rather than having the amplifiers located within the router and therefore close to the board, the amplifiers are within the antennas themselves. This lessens the possibility of amplifying noise from the router board and encourages a cleaner wireless signal with less interference. The 4 external active antennas are especially advantageous for smartphones, which due to their size don’t have the most powerful radios. Note that due to the fact the amplifiers are located on the actual external antennas, they cannot be replaced. There are a further 4 internal antennas. Most home routers support only 4 physical LAN ports, the R8500 has 6! Not only that, but it’s possible to ‘aggregate’ two ports together to grab 2Gbps throughput. This is ideal for connecting a NAS drive (if it supports link aggregation/port-channeling) to increase data flow. All of these awesome features don’t mean crap unless there’s a powerful processor to take care of things. Luckily the X8 uses a 1.4GHz DUal Core Broadcom BCM47094 processor to ensure a ‘sturdy ship’. To help avoid buffer and lag, Netgear have provided Quality of Service (branded as Dynamic QoS by Netgear). Dynamic QoS prioritizes network sensitive traffic such as voice, video and online gaming over all other types. There’s a USB 3.0 and USB 2.0 port if you prefer to connect your storage this way. Use Google Drive and Dropbox to store your files within the cloud. By plugging a USB drive into the Nighthawk, and using the ReadyCLOUD portal or mobile app, you can safely store or backup your files for free. Use Beamforming to extend coverage even further. Time based control of what is accessed and when. Set up a guest network for your visitors so that they can access only the Internet. It ensures your network files remain private and free from potential viruses your guests may inadvertently carry. There’s the option to connect into your network safely with OpenVPN. Connects to DLNA devices for easy sharing. Along with cloud storage (READYCloud), there is also READYShare Print & READYShare Vault. These features enable easy print sharing and local storage/backups respectively. Should you not require wireless or those blinking LED lights, there are buttons available to disable either or both. Read about the Nighthawk X10 – the X8’s successor!